Since I talk better than I type, If you would like to watch the video replay of a webinar I did explaining this entire process, CLICK HERE. 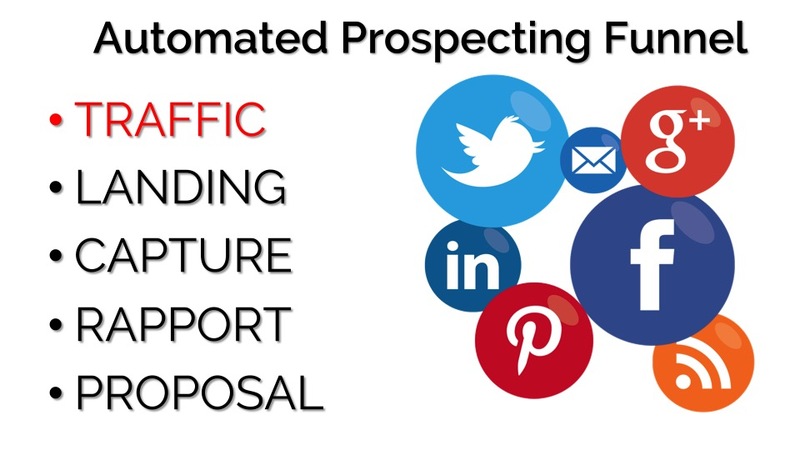 How would you like to automate lead generation for Your Business? In fact could you imagine having the ability to introduce an unlimited amount of people to your product, service, opportunity or company almost completely on autopilot?…well I’m going to show you how to do just that! I’ve been in the direct selling industry for more than 21 years now and have recruited more than 1,100 personal reps and built multiple teams into the tens of thousands and the #1 thing I found that you HAVE TO HAVE to succeed is LOTS and LOTS of LEADS! 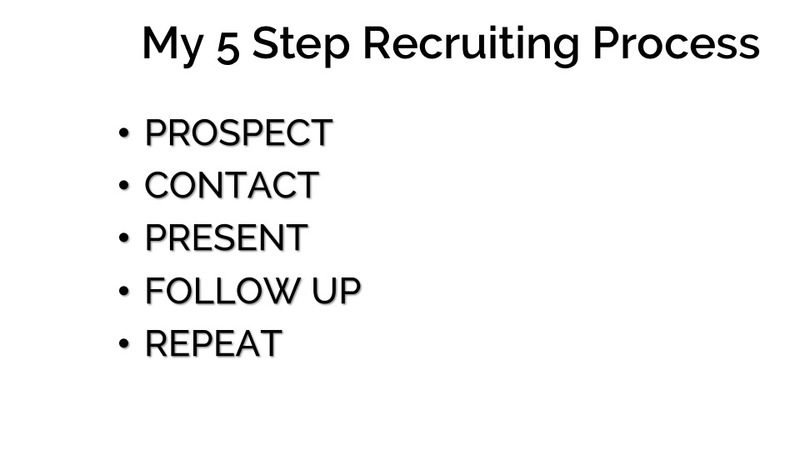 What I’m going to go over with you is how I’ve used NEW School technologies along with old school philosophies to automate my recruiting and team building and how you can too. I hope you got that! You see if you can automate your core tasks with systems, you generate leverage. Leverage gives you the ability to do much more in shorter periods of time and maybe even more importantly, it’s trackable and scaleable. 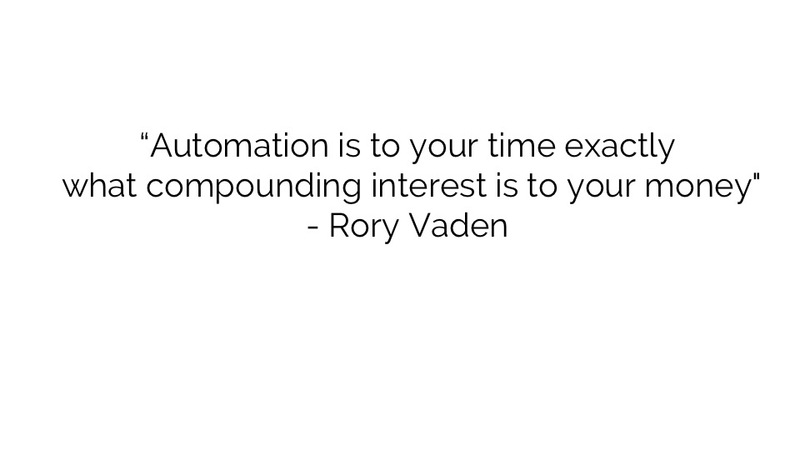 Although this formula ALWAYS works, I asked myself, “How can I automate this process?”. That lead me to learning a LOT of new technologies….ALL of which have paid off BIG TIME! Traffic is merely getting eyeballs on your offer. Landing is the page on which you are making some type of offer for a free book, PDF, video or audio. Capture is the person submitting their information in exchange for your offer. Rapport is EXTREMELY important. Rapport is all about building trust in your offer or you as a person so that at the end of that process, you then have the credibility and influence enough to make your proposal. 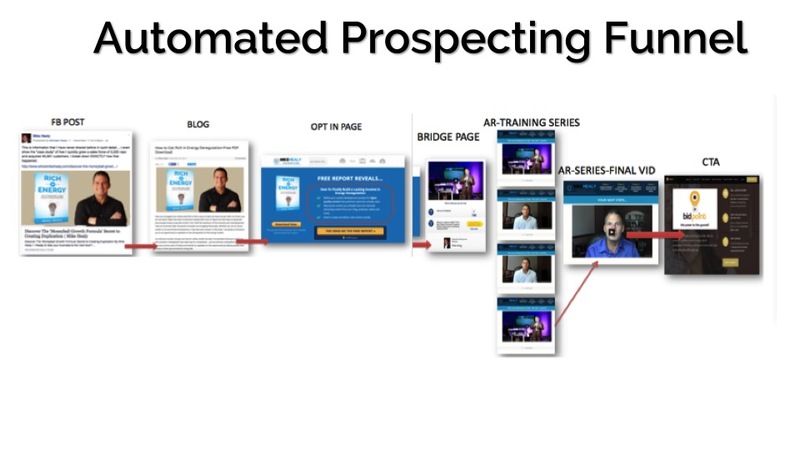 The image below really breaks down each step of the prospecting funnel I created for my company, BidPoint. My goal is to get people to involved that like the idea of earning residual incomes off of businesses energy usage. They get paid based on just referring the client to us and we pay them handsomely for their referral. How I start the process is offering a free PDF called “Rich in Energy”. Ultimately I make a blog post that I write based on my target market. I then post it on my Facebook page and run an ad to that. Once people visit the blog page and read the content, I have some type of call to action. In this case it is the free rich in energy PDF. Once they opt in, I deliver the PDF and add them to my autoresponder. They then receive a short sequence of emails with a video in this case, breaking down specific points and/or chapters in the PDF. This video series is what helps educate the person on energy as well as build rapport. Once the the final video comes out, I make my proposal for them to get more information about my company by visiting the site. 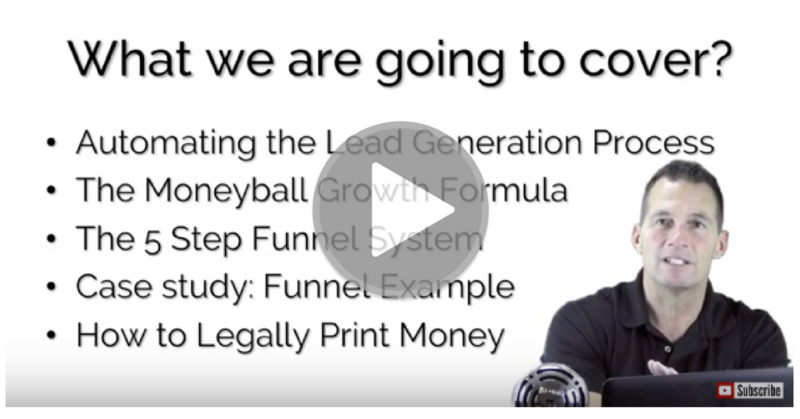 So as you can see, I pretty much automate the 5 steps I talked about earlier and I incorporate all the funnel principles as well. 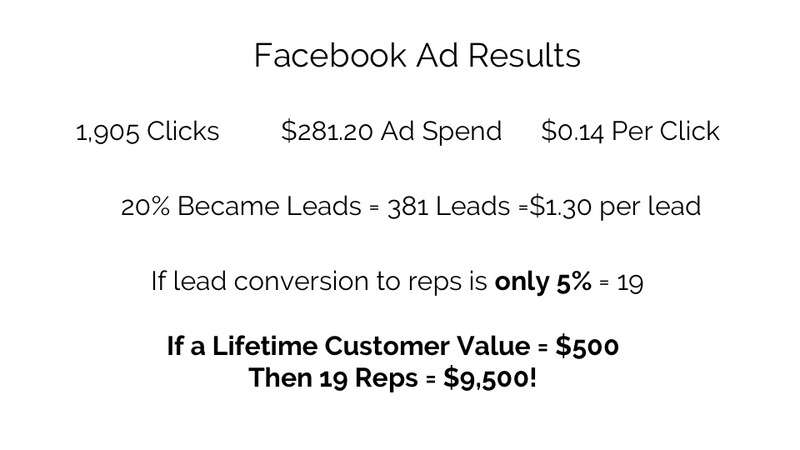 Now I want to show you some examples of the cost and results I get using this system. 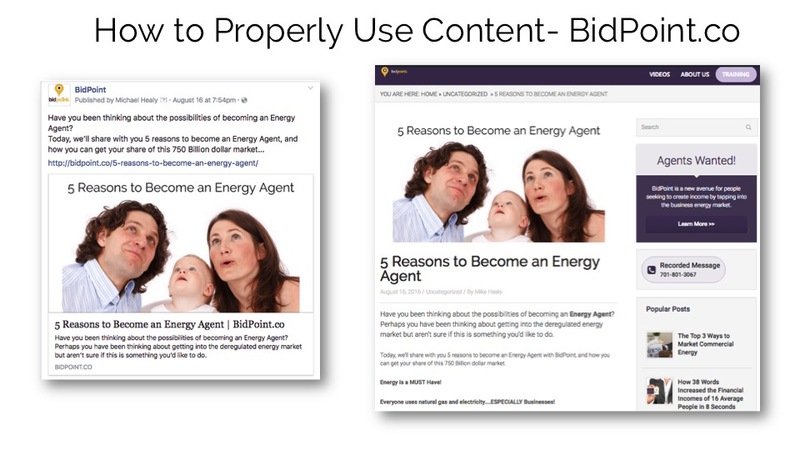 Below you can see an image of my Facebook ads manager where I show just the 10 small ad campaigns I tried and tested for my energy book. The results were great! Now below is an image of all of the things I tracked and measured. These numbers give me exactly what I need to see if the system is working and if I’m profitable and if I should scale it up down or kill it. As you can see, using this type of system practically gives me a license to print money. How fired up would you be if you spent $281.20 and made $9,500?…Pretty cool, huh? Now the other thing I think is VERY IMPORTANT, is you must understand that it ALL STARTS with good content. 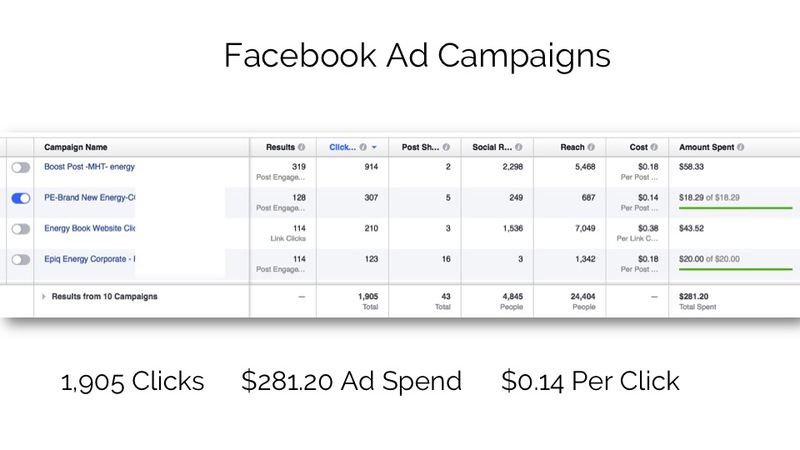 That means that the actual ad on Facebook does not look like an ad but a good article written to my target market. As an example, below is an image of the types of articles I use on my BidPoint site to drive targeted traffic. Notice the image, header and congruency of the post on the blog and Facebook. I HIGHLY RECOMMEND that you go to our company’s blog site just so you can see the types of images, header text and calls to action that we use for our company. 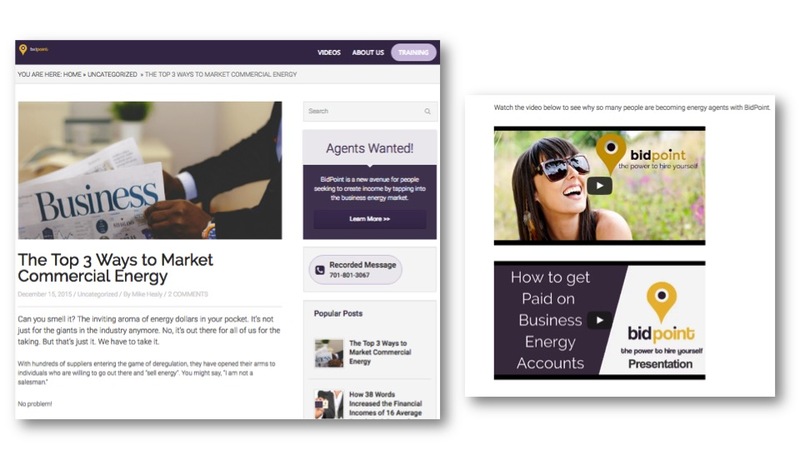 As an example, the article below hits our target market and at the end of the article there’s a suggestion to watch a couple videos that explain the benefits of our company. Using what is called “Native Advertising”, it’s the most powerful way to introduce your ideal prospect to your company with out shoving it down their throats. 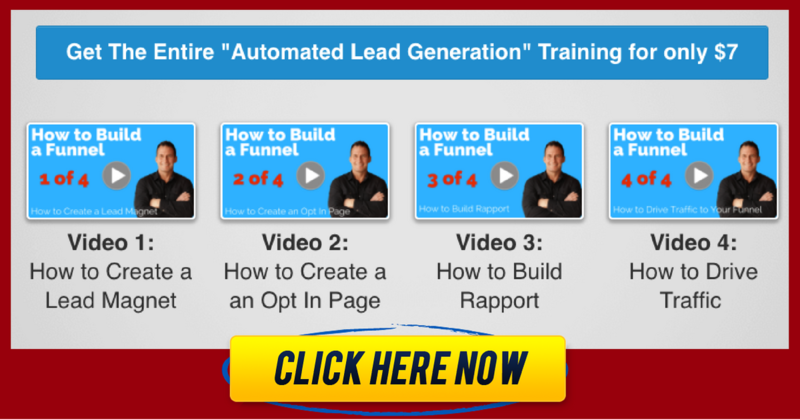 Below are some actual completed lead generation funnels I use. Check out the Rich In Energy book funnel. Opt in and watch the process. Check out the articles on my company site. This will give you some great insight on the way we structure our posts. 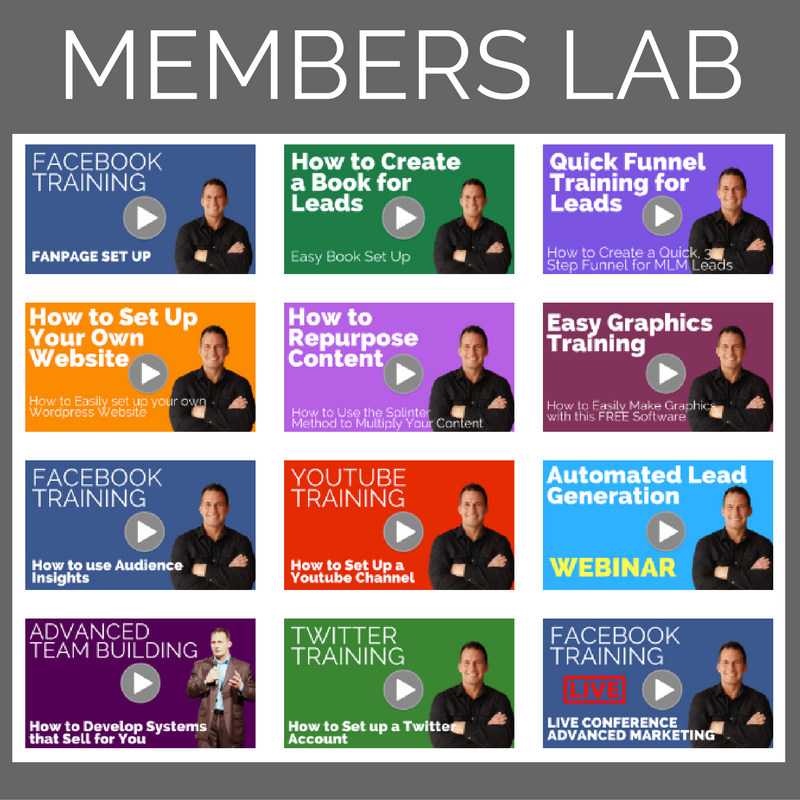 Last thing…if you are TRULY serious about generating leads for your business, regardless of what it is, you may also find this training series I did EXTREMELY helpful. It’s a 4 part video training series I did on a green screen so I could walk you through the entire process. Most people told me to charge anywhere from $97-$197 for this training but I decided to charge only $7 for the entire course. 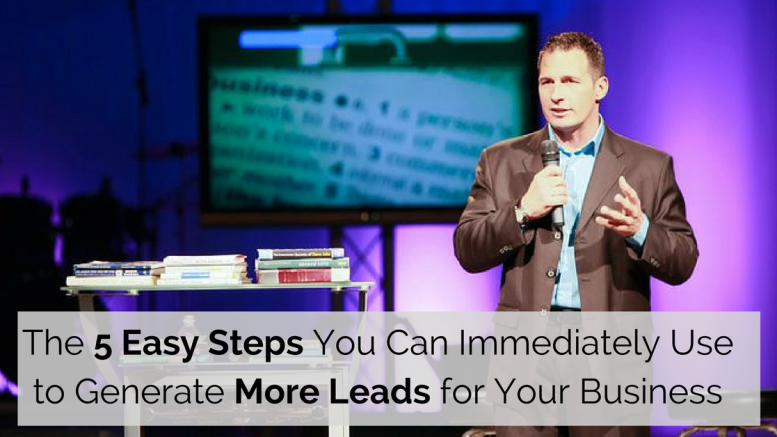 Be the first to comment on "The 5 Easy Steps You Can Immediately Use to Generate More Leads for Your Business"